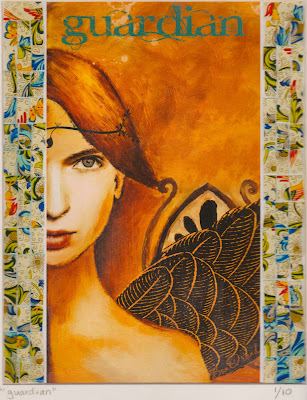 I am trying to do something different - a series of angels which are printed on museum rag and then hand-tinted and collaged with italian papers and other beautiful trimmings such as old stamps and paper I have painted and cut into tiles. Each angel will be the same face - my own painting of my daughter-in-law's angelic face - but each will be individualized with the trim, lino-cut wings, halos, etc. They will be finished with a UV coating to protect the vivid colors, matted, signed, and designated with the edition number. This is the first of the series - simple with woodcut wing, script, and florentine paper tiles.